Gearbox Software became a household name for gamers last generation with the hit Borderlands series. Borderlands was an experience gamers didn't even know they wanted, wrapping a fusion of first-person shooting and loot-grabbing RPG elements in a living comic book art style. Gearbox wants to change your perception of genres once again with Battleborn, a new IP being published by 2K for the Xbox One, PlayStation 4, and PC. 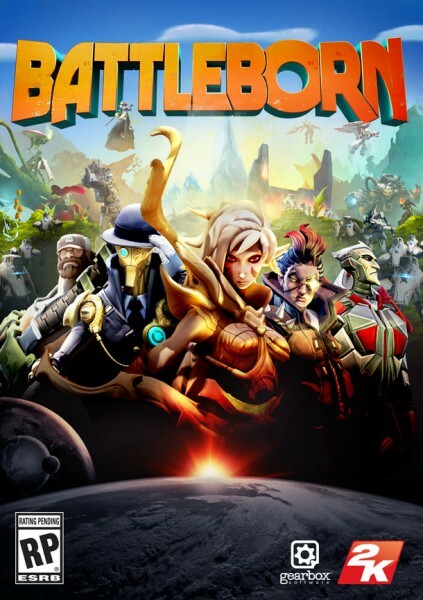 Battleborn takes the minion smashing and fast leveling often associated with MOBAs and injects it into an intergalactic first-person battle arena. The game's dramatic story assembles a universe's worth of disparate heroes, from an immortal samurai to a minigun-wielding giant, all battling over the last star in the cosmos. The absurd premise blows open the doors for creativity, allowing the innovative minds at Gearbox to create a tremendous rogue's gallery of playable characters. We visited Gearbox's studio in Plano, Texas to talk with the developers about Battleborn and play the first announced competitive match type for Game Informer's August cover story. We played hours of Incursion, an inventive 5 vs. 5 mode that combines fast-paced first-person gameplay with the strategic team-based elements of games like League of Legends and Dota 2. Rival battleborn hunt one another in lush jungles and arid deserts while robotic NPC minions wage an ongoing tug-of-war. Players start on a level playing field at the beginning of each match, progressing along a streamlined skill path up to level 20 filled with customizable abilities that unlock a variety of different play styles. Many of these gameplay elements will also bleed into Battleborn's five-player cooperative campaign, which Gearbox isn't saying much about yet. Gearbox's unique universal apocalypse premise pulls together a ton of unlockable playable heroes that not only look wildly different, but control like they're from entirely different first-person games. The consummate space marine feels like he's been ripped from any modern shooter. A spry elven huntress leaps far above other players' heads and rains down volleys of deadly arrows, evoking memories of high fantasy heroes. Imagine an archetype you've always wanted to pit against another in a first-person shooter, and that's the dream Gearbox is bringing to life. Battleborn is an exciting new IP, and there's a lot of cool stuff to talk about with this retail release, including the huge cast of characters, rivaling factions, and Gearbox's signature sense of humor. We discuss it all and more in our 12-page cover story, which is packed with gorgeous screenshots, hands-on impressions, and exclusive details straight from Gearbox. You can get a sample of our month of exclusive online Battleborn coverage by watching our coverage trailer below or on YouTube. You can also watch Battleborn's announcement trailer by clicking here. 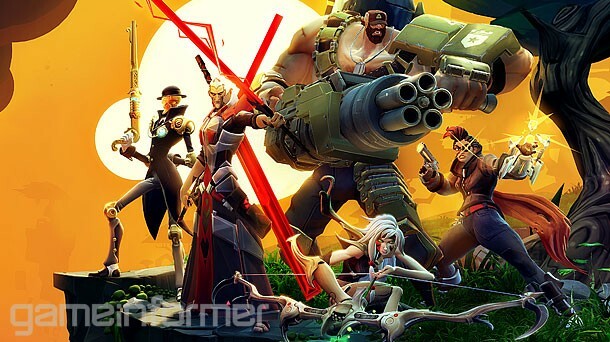 You can also get a better look at some of Battleborn's heroes on 2K's temporary box art below. 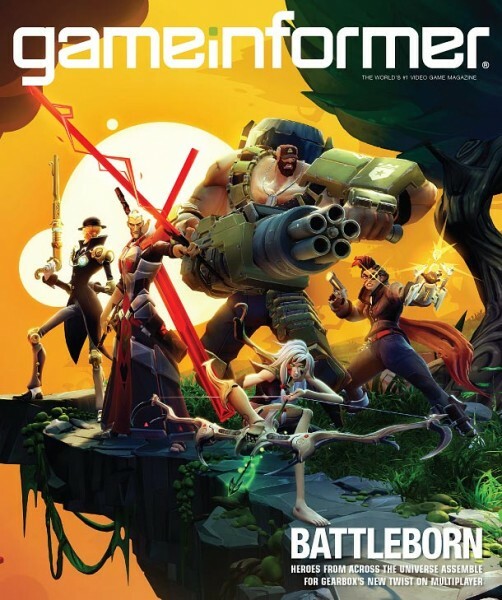 Battleborn didn't appear at E3 2014, but the rest of the August issue is packed with previews and impressions from the show. Our E3 Hot 50 list returns, filled with so many great games that it killed us trimming down all the great choices from the show to 50. Between Witcher 3: The Wild Hunt, No Man's Sky, Middle-earth: Shadow of Mordor, and Evolve, there is some amazing gaming in store for us. We've also rounded up everything you know about the upcoming virtual reality kits, graded the big publishers' press conferences, and more. Print subscribers should see their issues arriving in the next week or two, but it will be available later today if you subscribe digitally (available on PC/Mac, iPad,Android, and Google Play). You can also get the latest issue through third-party apps on Nook, Kindle, and Zinio starting tomorrow. To switch your print subscription to digital, click here, or to create a new subscription to the digital edition, click here. We have a full month of Battleborn coverage set up for gameinformer.com, complete with video interviews with the developers, closer looks at the diverse cast of Battleborn, and exhaustive hands-on impressions. Remember to keep checking our Battleborn hub throughout July for all the exclusives. Access the hub by clicking the banner below.